Schreier: This game is very inspired by Final Fantasy—there are a lot of Final Fantasy references in the names, the items, the spells, the job classes. I'm wondering: Why is this not a Final Fantasy game? Asano: This project was originally planned as a sequel to 4 Heroes of Light, and so you will notice some Final Fantasy flavor here and there as a result of that. But we decided early on that we would like to challenge ourselves with the opportunity of creating an entirely new title that wasn't related to previous games, and we felt like that would spur us on to completely different directions for this kind of game. Schreier: So I'm curious, since you decided to create this as an entirely new title—why did you keep all of the references, like even the spell names and the item names? Why didn't you change that when you decided to not make it a Final Fantasy game? Asano: Certainly when you look at the game and you think about some of the elements here like turn-based combat, or a job system, or even the fact that people are exploring a world looking for crystals, you definitely start to get the sense that there are a lot of classic Final Fantasy elements. And I think that the names you're talking about were just another one of those factors where we felt like these are things that are familiar to people and make it easier for them to get into the game. So we decided to keep them intact for that reason. Schreier: You've said that you want to make a Bravely Default every year, and that you want it to become a big franchise. Will this stay as similar to Final Fantasy, and will we kind of have two different Final Fantasy series going on at once, or do you plan to evolve it further and move it away from those elements—the crystals and the Phoenix Downs and the spells and the jobs and all that stuff? Asano: Right, we would like to do a new Bravely Default every year, and we've actually already announced Bravely Second in Japan, and hope to be releasing it this year. But I do believe that Bravely Default will continue to evolve in its own direction. It may retain some of the world feel, for example, the crystals being an important story element. But I believe it's going to be generating a lot of its own new terms as well. Schreier: So I know that you released For the Sequel in Japan, and that the version we're playing here in the West is based on For the Sequel's improvements, but other than the new stuff in there, is there anything in Bravely Default that either of you guys wish you could have done differently, or is there anything you would have changed if you could do it all over again? Asano: No, I feel like we really did get a lot of improvements in from the Flying Fairy version, and there was nothing that was on our list of improvements that we did not implement. So I didn't feel like we had really left anything undone. What do you think, Mr. Takahashi? Takahashi: Well certainly we did make all the improvements that we had talked about. I think that some more distant possibilities could have been like adding more resources or new summons, things like that. But we covered all the bases of what we wanted to improve from Flying Fairy based on feedback. Schreier: What are the advantages and disadvantages of making an RPG on the 3DS as opposed to a console? Asano: When we're talking about Bravely Default, this is a game that would take people about 50-60 hours to complete, and I like to think that when you're playing that on a handheld, you can have a much more comfortable experience; you can be laying down on a bed, or playing any time anywhere. It makes it much more convenient and comfortable. As far as disadvantages, I suppose that if you're comparing this to console games, then you're certainly dealing with the smaller screen, but in the case of the Nintendo 3DS, you have a stereoscopic display that allows us to do things that are only possible on that system. And we really enjoy the process of going from our concept illustrations and backgrounds to interesting ways to represent that space that I think we could not have done anywhere but on the 3DS. Schreier: OK. I know that you've mentioned that at first you weren't considering localizing this game in the West—what changed your mind? Asano: That's right, our initial goal was really just to make an RPG for Japanese fans, with all of our available resources and energy. We weren't thinking about localizing an overseas version at all until after we released the Japanese version, and it was so well-received that news started to get out. We saw that there was quite a bit of demand overseas for this game as well. It was at that time that we decided to partner with Nintendo to pursue that opportunity. So it wasn't until after the Japanese version of the game came out. Schreier: So when you made that decision, is there anything you thought you might have to change or add for the West that would appeal more to Western audiences? Asano: No, there's nothing really that we felt like we needed to change in that regard. We got the sense that fans overseas were reading about the Japanese version of the game and were attracted to that, so really what we're interested in is providing them with that same experience. Schreier: You mentioned the sequel before, Mr. Asano—would you like to bring that to the West also? Have you already made that decision? Asano: We certainly would like to release the sequel in the US as well, but we're definitely going to be taking a look at the sales for this one. Schreier: So there are a lot of different opinions on Japanese RPGs in the West, and people have different feelings about them. Personally, I love the kind of "old school" Japanese RPG feel that a game like Bravely Default has, but there are some people in the west that don't like turn-based gameplay or invisible random encounters. Would you consider making a game without those features? What are your thoughts on how Western audiences look at those traditional Japanese features? Asano: Certainly these are rather old game mechanics when you're talking about turn-based combat or random encounters in the field. But we also feel like there's kind of a line of succession here in terms of how the features have been handled in various different games... Bravely Default I feel like is definitely suited for a certain market that likes those features, and those were really the kinds of people that we were thinking of the most when making it. Schreier: And what do you think is the next evolution for those mechanics, those features in games? 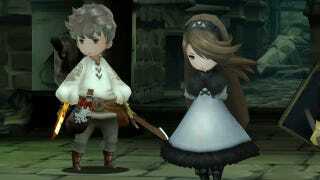 Asano: I think that we're already seeing here in Bravely Default a bit of an evolution to turn-based combat. For example, if you consider the Brave and Default mechanics, where you can save a turn or spend a turn, this is a certain kind of evolution of turn-based combat, I think. And also in the North American version you have the Bravely Second system which allows you to stop time and act out of turn. And I think that's another idea that is very close to evolving the way we think about turn-based combat. But I would also like to point out that if you change some of these systems too much, they start to lose the classic feel that they're referencing in the first place. So we're very careful to keep that feeling intact. Schreier: So in Bravely Default there are 24 different jobs. Other Final Fantasy games have different numbers—some have more, some have less—and I'm curious: how do you know how many classes to use for a game like this? How do you know when the number is just right? Takahashi: I believe the best way to address this question is to talk about what we did in the case of Bravely Default, and the reason that there are 24 jobs here is actually based on story cues. If you have four crystals and you're talking about a certain number of jobs being associated with each one of those, we get to the number 24. And we also thought about how many jobs we could show on one screen. So there was some UI consideration as well. Schreier: There are microtransactions in Bravely Default, and that's something that concerns some people. In this game they don't seem to be necessary—you don't need them at all to play, or to beat bosses and difficult battles. But some people are worried that because they exist, they might affect the balance in future games. And I'm wondering how you guys approach these microtransactions without hurting the balance and without making people feel like they have to use them in order to succeed. Asano: So I think you're referring to the SP Drinks, when you talk about microtransactions. That's an item that will allow you to charge up SP that allows you to use the Bravely Second system. And normally, you would gain one of these SP per eight hours of inactivity, so you would only expect to be able to use Bravely Second about 2-3 times per 24 hours. And that's the rate around which we were really thinking about the balance of the game when designing encounters and thinking of difficulty. It's a very strong move, and doing it about 2-3 times per session in a day felt about right to us. It's very helpful of course, but it's not needed for most players. It's something that can help new players address some difficulty, if they just can't seem to get past one boss. But it's something that also removes the damage cap, so even advanced players might come up with a bit of a meta-game where they try to raise meters to create the largest hit possible. And so from both perspectives, whether you're a new player or an advanced one, it's something that's there for both fun and comfort in the play experience. Schreier: Here in North America, the first reaction to the name Bravely Default is "whoa that's a weird name" because it sounds very bizarre in English. Did you guys realize how strange it sounds in English, and did you ever want to change the title in the West because of that? Asano: As I mentioned earlier, we were really designing this game with Japanese RPG fans in mind, so the fact that the title might have sounded a little bit strange in English wouldn't have been a problem for us at that time when we were thinking about only Japanese fans as the audience. But when we decided that we would be doing a localized version, we did have a discussion about whether to change the title to something that might sound a little more acceptable in English. But the issue for us was that people in the US already knew about the game because it was so well received in Japan. And they knew it by that title. So we decided to keep that title. But ultimately I feel like because it is a JRPG and we really are trying to reference some classic feeling from JRPG titles, I think that having a title like this communicates that content pretty well to the market also.